In today’s world Robotics is a quick growing and attention-grabbing field. it's easiest method for contemporary technology modification. Obstacle avoiding robot is starting stage of any automatic robot. This Robot has adequate intelligence to hide the utmost space of provided area. it's a infrared sensing element that square measure accustomed sense the obstacles returning in between the trail of automaton. It'll move in an exceedingly explicit direction and avoid the obstacle that is returning in its path. We've used 2 D.C motors to offer motion to the automaton. The development of the automation circuit is simple and little. The physics components utilized in the automaton circuits square measure simply on the market and low cost too. You can also Subscribe to FINAL YEAR PROJECT'S by Email for more such projects and seminar. The project uses microcontroller AT89C52 as the controlling component. It uses IR (Infra Red) sensors and two IR transmitting circuitry. When any object comes in path of robot, IR beam is reflected from the object then sensor gives zero voltage to micro-controller. This zero voltage is detected then μc decides to avoid the object by taking left or right turn. If the sensor gives +5v to μc that means there is no obstacle present in it path so it goes straight until any obstacle is detected. The two IR transmitter circuits are fitted on front and left side of robot. The two IR sensors are placed near to transmitters’ IR LEDs. The connections can be given from main circuit to sensors using simple twisted pair cables. Two motors namely right motor and left motor are connected to driver IC (L293D). L293D is interface with μc. Micro-controller sends logic 0 & logic 1 as per the programming to driver IC which moves motors forward or reverse direction. In this project, the IR Transmitter block mainly used to generate IR signal. It uses timer IC555 in astable multivibrator mode to generate square wave which have continuous pulses of 50% duty cycle of frequency 38 KHz. 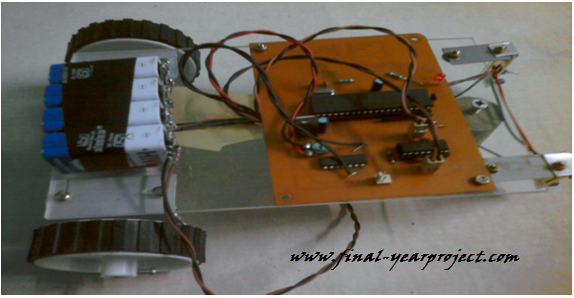 This report contains circuit diagram, block diagram, full working along with microcontroller programming of obstacle avoiding robot project. Use it for your reference and study work only.